View More In Valve Caps. No more flat-tire panic: This Mini Bike Pump is your new insurance policy against emergencies! With this little life saver mounted to your road or mountain bike, you can hit the open road with peace of mind. You can easily alternate between Schrader (default) and Presta simply by turning the nozzle to the desired configuration. No fussing with tiny extra pieces like other micro pumps. ► Presta and Schrader Compatible,fits securely without leaks! ► Compact And Lightweight Bike Pump. ► High Pressure Barrel- 120 PSI. You'll get a puncture when you least expect it, so be prepared. Get riding again in minutes with this Glue-less Emergency Puncture Kit. Just patch, then inflate - get riding again faster! 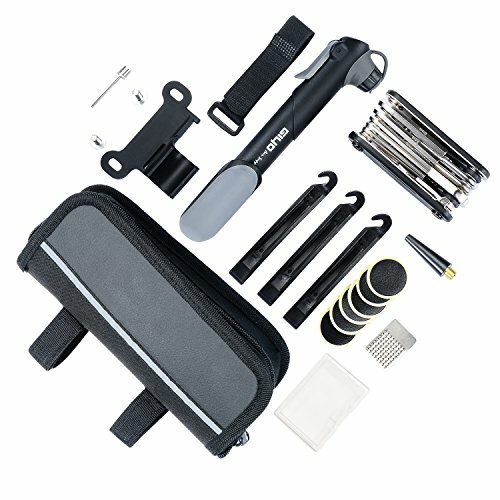 A work kit bag for free, All things are packed in a small kit bag to avoid the small tools' lost.Easy attached to saddle of bike for travel, and also can be used separately as daily household repair tool. Mini Size High Quality: This Mini Bike Pump is ultra-durable design and easy to carry. With a 120 PSI capacity, Mini Bike Pump can be used to inflate bike tires during emergency repairs or simply to maintain tire pressure over the course of a season. Super Fit Schrader&Presta Valve: Compatible with both Presta and Schrader valves, no leaks, firmly grips both Schrader and Presta valves automatically. ULTRA LIGHTWEIGHT: Portable tire pump is almost weightless and extremely compact that can be attached to the bike frame under the water bottle cage easy. BONUS BIKE PUMP ACCESSORIES: Comes with a bicycle tire repair kit,16 in 1 Multi-Function Bike Tools/ 3pc tire levers/ 6pc Tire glueless repair tool/ 1pc metal tire rasp and along with a pair of handy tire levers and a ball needle/inflation valve for Inflatable toys,basketballs, footballs, soccer balls & more. WITH PORTABLE BIKE BAG, LIGHTWEIGHT: Packed all the tools in the portable bike bag, hang on your bike tube or frame. If you are planning short or long bike trips, this bike repair kit will be a good choice, it can accompany you wherever you might need it. If you have any questions about this product by YOUYOUTE, contact us by completing and submitting the form below. If you are looking for a specif part number, please include it with your message.